But it turned out that it is not so easy. It looked like somebody else (for example, Sergey Shipov) had already commented six or seven games. It seems to be impossible to vie with the best commentator of our country (without any hints at irony). I invented the heading to one of the games but it turned out that the winner would write about it (I guess this is how it should be). At last, Maxim chose one game himself! When it seemed to me that it was necessary to wait for the next month, I paid attention to this game. And I don`t regret because I got some kind of master class from the ex-world champion. It looks like White made a decisive mistake on about the eighth move. I hope that Vassily Yemelin will forgive me for this wording. 1.e4 c6 2.d4 d5 3.exd5 cxd5 4.c4 ¤f6 5.¤c3 e6. I don`t consider mtself a great specialist of this variation. 5...¤c6 is a more popular move but it is evident that the 12th world champion can have his own views on any opening. 6.c5. If White begins with 6.¤f3, then one can play 6...Ґb4. Perhaps, Vassily didn`t like this continuation. 1) 8.b4!? b6 9.¦b1 bxc5 (9...a5!?) 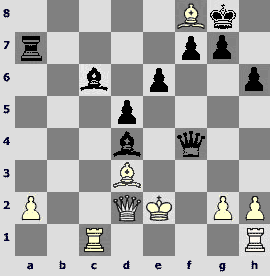 10.bxc5 ¤e4 11.¤xe4 dxe4 12.¤e5 Јc7 13.Ґf4 ¦d8 14.¤g6! (14.Јa4 g5! 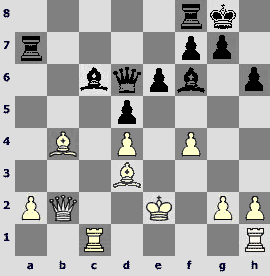 15.Ґd2 Ґd7÷ Morozevich – Bareev, Dortmund 2002; 15.Ґg3!?) 14...Јa5+ 15.Ґd2 Јc7 16.¤xe7+ Јxe7 17.Ґe3 (17.Ґa5 ¦d7 18.Ґb5 ¦d5) 17...¤c6 18.Јa4 Ґb7 19.Ґb5 Јc7 20.0–0І Morozevich. 2) 8.Ґd3. 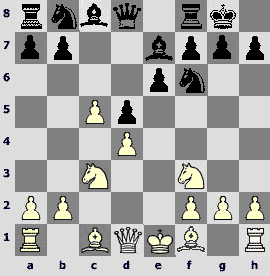 I managed to find only one grandmaster game in this variation: 8...b6 9.b4 a5 10.¤a4 ¤fd7! b2) 17.¤xf7 Јe7+ 18.ўd2 Јe2+! 19.Јxe2 dxe2 20.Ґxf8 (20.¦xg6+ ўxf7 21.¦xf6+ ўxf6 22.Ґxf8 axb4! – см. 20.Ґf8; 20.¤d6 axb4! 21.¦xg6+ ўh7 22.Ґxf8 ўxg6–+; 20.¤e5 ¤xe5 21.dxe5 Ґxe5 22.¦xg6+ ўf7 23.Ґxf8 Ґxa1 24.¤xb6 ўxg6 25.b5! ¤c6!! 26.¤xa8 ¤d4!–+) 20...axb4! (20...ўxf7 21.b5! ўxf8 22.cxb6! … ¦c1) 21.¤xb6 ¤xb6 22.¦xg6+ ўxf7 23.¦xf6+ ўxf6 24.cxb6 b3 25.a3 (25.a4 ¤c6µ) 25...Ґf5 26.ўc3 ¤d7 27.Ґb4 (27.Ґc5 ¤xc5 28.dxc5 d4+!) 27...Ґc2µ (I used some comments of Haba). 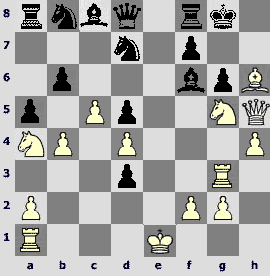 8...b6 9.b4 a5 10.¤a4 axb4 11.¤xb6 ¦a7!N One of the games of the latest Chigorin Memorial continued by 11...¦a5!? This move has some advantages because Black threatens with a piece sacrifice on c5 to regain the b6-knight with material gain. 12...¤fd7! A strong idea!The computer doesn`t understand the sense of the Black`s plan. 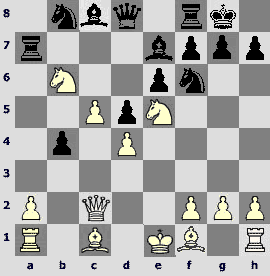 It gives White an advantage in different variations until the 18th move, but then sees things clearly. 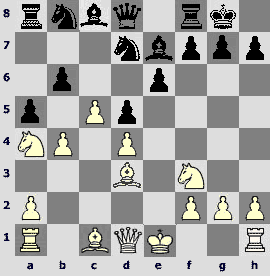 White has serious problems and I didn`t manage to find a clear way to equalize the position. Also possible is12...Јc7!? 16...¤c6 17.¤xc6 (17.Ґe3 Ґxe5 18.fxe5 f6!і) 17...Ґxc6 18.Јb2 (18.Ґe3 ¦a3!µ) 18...Јa5! 19.ўe2. If 19.Ґxb4, then 19...¦b8 20.Ґxa5 (20.¦b1 Јxa2–+) 20...¦xb2 21.Ґc3 ¦xg2 22.a3µ and it is evident that Black has a big advantage. 21...Јxf4! What an excellent finale! Black wins with a frontal attack. Bravo, Anatoly Evgenievich!